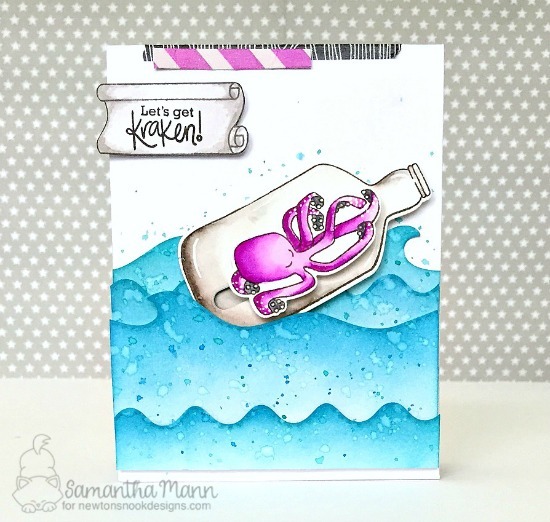 This slider card by Samantha is so fun! She used our Message in a Bottle Stamp Set to create a fun image of a bottle with a little purple kraken sliding up and down inside it! How perfect is that? It's just like he's bobbing in the water! She stamped and colored the bottle and the kraken and trimmed them both out using the coordinating Message in a Bottle Die Set. The she created a little slider inside the bottle and attached the kraken to that! The she added it to her card with fun layers of water that she created using our Sea Borders Die Set. This set has 3 fun border dies that are perfect for making water scenes. She inked the edges of the die cut pieces with distress in and splattered it with water and ink droplets to get even more of a water look! So fun! She finished off the card by stamping the "Let's get Kraken" sentiment inside the little rolled message scroll and adding that to the card! The little bits of washi at the top give it the perfect finishing touch! Thank you Samantha for awesome inspiration today! To say hello to Samantha and see more of her beautiful creations, you can visit Samantha's Blog, Sam's Scrap Candy! Awesome card,totally loving the colors ! I like this card that is impressive and interesting, made by using eye catching colors. Thanks for sharing the idea.